implemented in a series of Watershed Implementation Plans (WIPs) for the Chesapeake Bay Total Maximum Daily Load (TMDL). The Phase III WIPs are due to be completed in 2019. 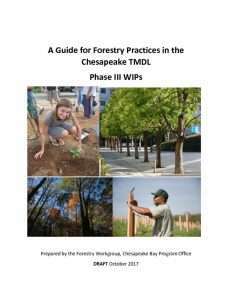 The Forestry Workgroup created this guide early in the planning process to help localities, conservation agencies, community groups, states and others planning and implementing BMPs. Specifically, this guide demonstrates the water quality values and benefits of forest retention, tree planting, and forest harvest BMPs. It also conveys information about the various forestry and tree planting BMPs in the Chesapeake Bay Watershed Model, including the approximate amount of opportunity for a particular forestry BMP (in acres), and other relevant factors.